This one-sheet religious tract caught my eye because it was published by the Full Salvation Tract Society in nearby Hanover, Pennsylvania.1 The Society was located at 214 High Street in Hanover, which now appears to be the address of a residence. The following note is added on the back: "Tracts Free as The Lord Supplies The Needs. Samples Sent Free. (Postage Appreciated)." The tract measures three inches by five inches. On the front is a picture of door with the writing "JESUS SAID, I AM THE DOOR. BY ME, IF ANY MAN ENTER IN HE SHALL BE SAVED." On the reverse side is a 28-line piece of verse titled "Only A Tract." 1. Joan and I acquired a bunch of old religious tracts as part of a box lot at an estate sale last autumn. The majority of them were produced by the still-active Pilgrim Tract Society of Randleman, N.C. 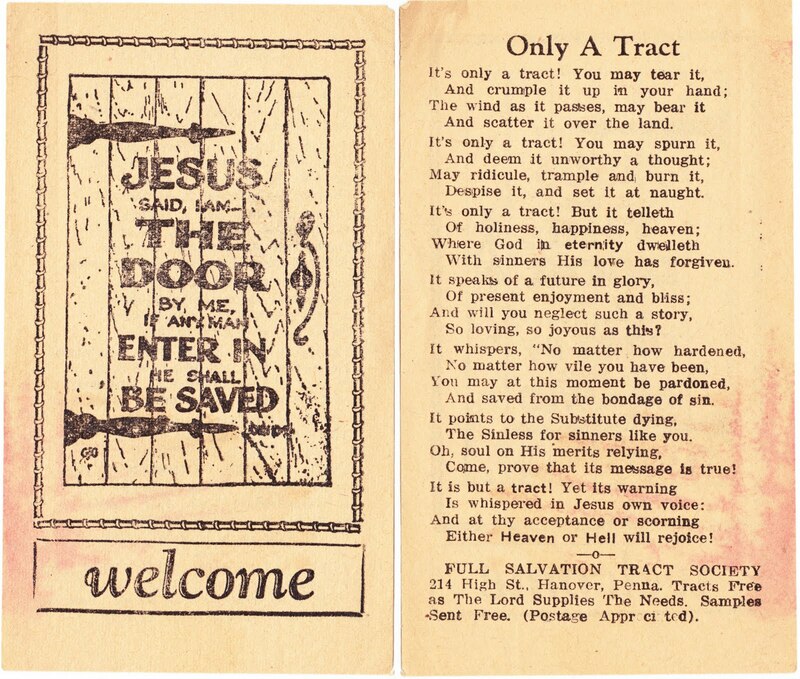 In November, Joan wrote about one of those tracts, which was titled, "The Lamentable Death of Polly Yost, Who Died in York County, Pa." I'll post a gallery of some of the more interesting vintage Pilgrim tracts — and there are a bunch — at a later date. 2. Radio reporter Herbert Morrison (1905-1989) once lived in Scottdale. He was best known for his live report of the Hindenburg disaster — "Oh, the humanity and all the passengers screaming around here."